If you want to boost your guitar skills, you need to increase your knowledge of chord voicings. There’s more than one way to play the same chord on the guitar. The good news is that the guitar is made up of a series of repeating patterns. We will use a system, called CAGED to understand the five positions of a major chord on the guitar neck. Once you learn how to voice one major chord and its relation to the CAGED pattern, you can easily voice the same chord in multiple positions. Approach your practice with a calm, positive mind. Take a minute to take a few deep breaths and visualize yourself with your instrument. This is your time to focus on your practice, so give yourself permission to mentally let go of the other matters in your day. Practice voicing the C, A, G, E and D major chords in the open position on the guitar neck. The open position refers to the area of the first three frets on the guitar neck where you have open (unfretted) strings ringing out. Practice moving smoothly between each chord. The goal is to memorize the shape of the chord, or the way it looks on the guitar. Voice a chord and identify the root of the chord by playing only the string(s) where the root is located. The root of the C chord is “C”, the root of the A chord is “A”, and so on. Again, the key is to think of the shape of the chord and memorize where the roots are within that shape. You don’t need to memorize string and fret numbers. NOTE: Instead of thinking of an open string as being open, think of the guitar nut located at the head of the guitar as being a finger holding a position. In other words, visually approach the nut of your guitar as being another fingered fret. Play the C major chord, starting in open position, and move up (higher) on the guitar neck through the five different shapes of the chord. In all instances, you will play a C major chord. The notes voiced in the C major chord are C, E, and G. All three of these notes that make up the C chord remain present as you move up on the guitar neck through the five positions. The only thing that changes is how the chord looks, or the shape, NOT the chord itself. REMEMBER: Where the chord shape ends, the next shape begins! Once you have moved the C major chord through each of the five positions, continue through the CAGED system voicings with a different chord. For instance, start on an open A major chord. The next shape for the A chord, moving up on your guitar, is the G shape, then E, D, and C.
Take a three-chord song you know in open position, find the next chord shape up on your guitar for each chord, and relearn the song in this new position. NOTE: Some positions are more friendly to play in than others. 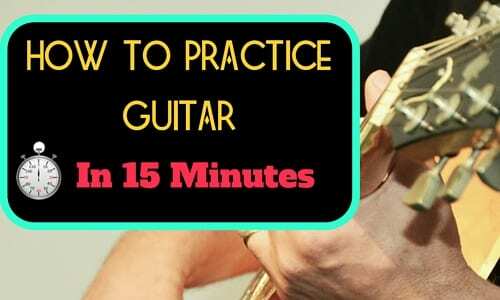 So next time you think you don’t have enough time, remember how to practice guitar in 15 minutes. Don’t let your busy schedule get in the way of your guitar playing journey. Ready to get started playing guitar? Search here for a teacher near you! Aimee B. teaches piano, guitar and music theory in Austin, TX. She earned her B.A. in philosophy and art from St. Edward’s University, has worked as a professional musician for over ten years, and has taught over 100 students as a private music instructor.